The General Services Administration’s (GSA) digital services team last week introduced a new Federal cloud service intended to help agencies develop applications in the cloud. 18F, the 19-month old digital consultancy that is part of GSA’s Office of Citizen Services and Innovative Technologies, will provide agencies with a Platform-as-a-Service (PaaS) solution that rests on its Infrastructure-as-a-Service (IaaS) offering. It will allow agencies to develop and run applications without having to use – or even build – their own infrastructure to support the work. 18F used the open source project, Cloud Foundry, to create the Cloud.gov. While Cloud.gov could save money, it could also save time. Cloud.gov is a significant development because it could speed up efforts to move agencies to the cloud, said Jamie Berryhill, chief of policy, budget, and communications at the Office of Management and Budget (OMB). 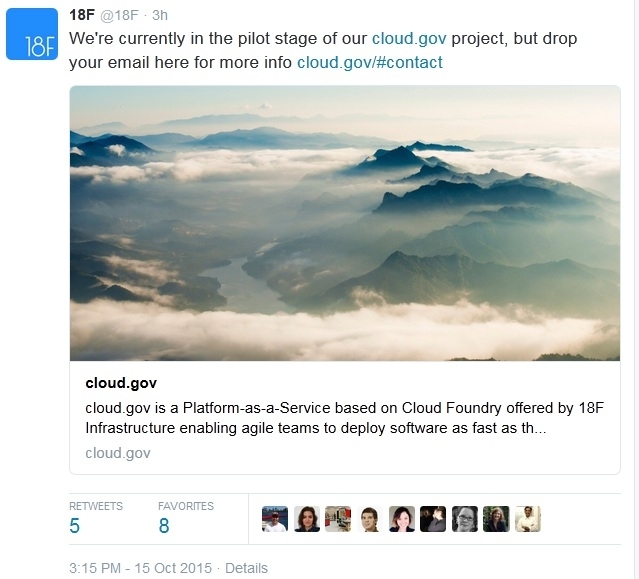 18F’s social media team on October 15 tweeted that Cloud.gov remains in pilot. Read GSA’s official announcement here. Read 18F product lead Bret Mogilefsky’s blog about Cloud.gov here.